Step 1 Heat oven to 200C/180C fan/gas 6. 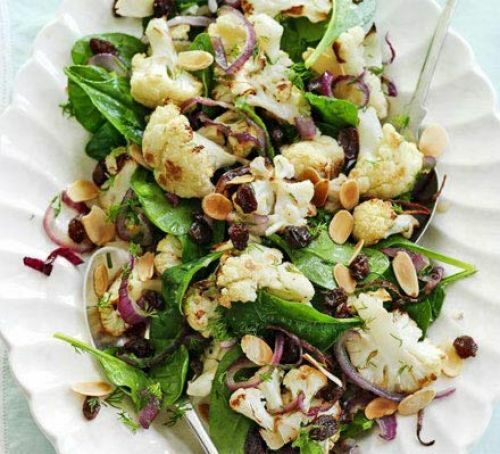 Toss the cauliflower with the olive oil, season and roast for 15 mins. Stir in the red onion and carry on roasting for 15-20 mins more until tender. Step 2 While the cauliflower is roasting, mix the vinegar, honey and raisins with some seasoning. Step 3 When the cauliflower is done, stir in the dressing, dill, almonds and spinach, and serve.